I started making this recipe several months ago. It is WAY overdue for some Blog Props. It's one of our favorites. Not only is it delicious (melt-in-your-mouth-delicious), it's super easy to prepare and very quick from the fridge to the plate. In fact, if you take my advice and double (or triple) the spice mixture, saving some for future usage, you'll cut your prep time down even further: approximately 10 minutes start to finish. Pair that with a simple salad and quick-cooking polenta and you have a delicious, healthy, impressive, dinner in about 15 minutes. The recipe is from an older issue of Cooking Light (September, 2010). I keep all of my issues and enjoy looking through them for new recipe ideas. I'm really glad I keyed-in on this one recently after overlooking it the first time through my issue. 2. Combine first 6 ingredients; rub spice mixture evenly over flesh side of fillets. 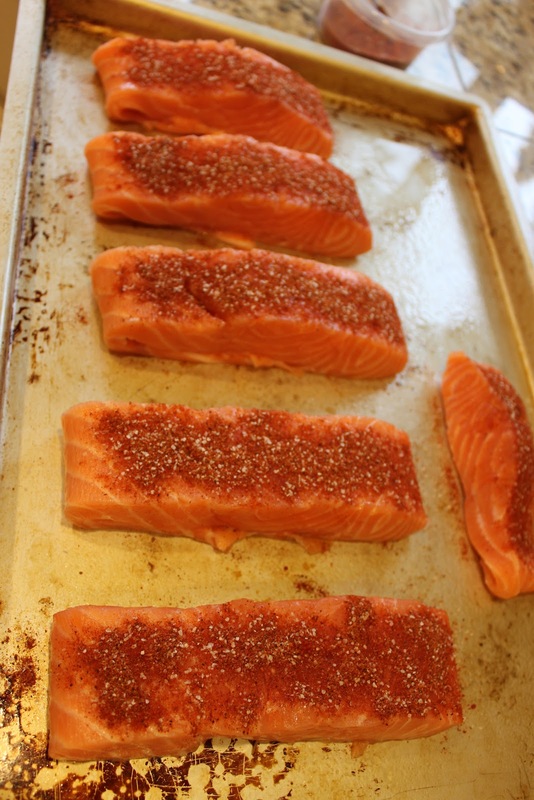 Place fish on a broiler pan (or lined baking sheet) coated with cooking spray; broil 6 minutes. Remove from oven and brush with syrup; broil 1 minute more. I like to buy my Alaskan salmon from Costco. It's fresh, flavorful, boneless and skinless. I can cut my steaks as wide as I choose and if I don't want to cook all of it, the rest freezes really nicely. 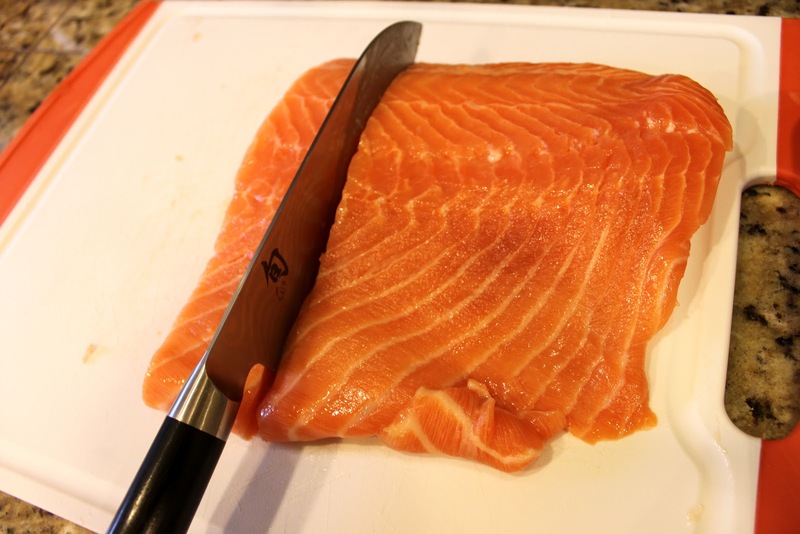 I find that with Alaskan salmon especially, there tends to be an edge and/or end of the fillet that is much thinner than the rest of the steak. I always tuck this part under the steak so that the overall thickness of the piece of fish is uniform. That way, the fish is cooked more evenly throughout--so don't be shy about bending and folding your fish! Most of the spices required for this recipe are already in your spice rack, I'm sure. If you find you cannot locate "Ancho Chile" powder in your grocery store, feel free to substitute it for more of the regular chile powder. I happened to have an amazing Moroccan spice blend from a local company, Dulcet, in my spice cupboard. Many of the ingredients in the Moroccan blend are also found in this recipe (chile, paprika, sugar, cumin, salt). In addition, the Moroccan has ginger, cinnamon, saffron, turmeric, garlic, and coriander. I have had this recipe with and without the addition of the Dulcet Moroccan spice mixture--both are delicious... But I have to say that the addition of the saffron, ginger, and cinnamon flavors from the Moroccan blend add to the outcome. I highly recommend you get your own HERE ($6). Generously sprinkle the top side of the fish with your seasoning mixture and pop it under your well-heated broiler. I move my broiler rack down a bit so that the top of the fish is approximately 5-6 inches from the broiler coils. Do NOT flip your fish. They only need to cook on the one side to be evenly done throughout. After exactly 6 minutes, take your fish out and brush on the maple syrup. 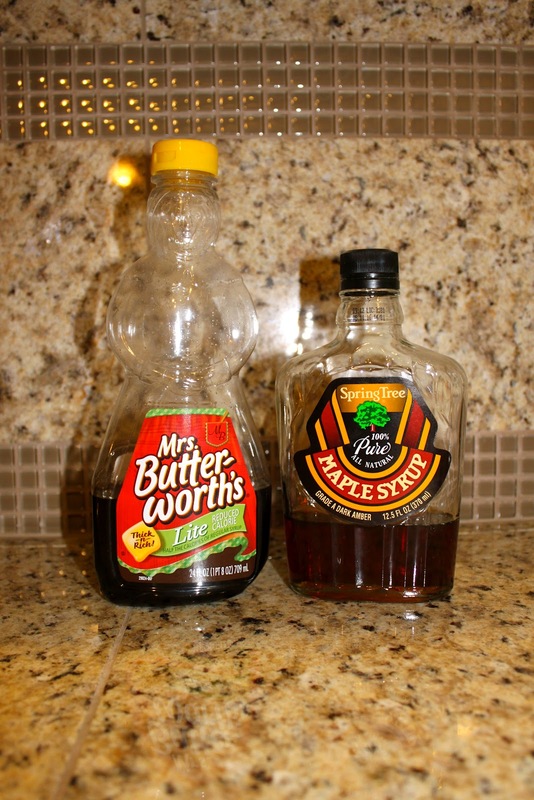 Please, learn the difference between pancake syrup and real maple syrup before you ruin your fish! Once coated, it's back under the broiler for 60 seconds more. The spices get "frisky" and the maple syrup gets crispy and caramely (I just made that word up) under the heat. The fish is perfectly done in the 7 minutes: tender, medium, rich in texture. This night, with Spinach Salad and Creamy Polenta. Although every member of my family flips for this salmon, we usually only go through 4-5 steaks during dinner. The typical fillet from Costco will make between 5-8 steaks, depending on the size of the piece of fish you buy. I suggest you prepare ALL of your salmon and save the extras in the fridge. We always follow-up with Salmon Caesar Salad later in the week and the leftovers are delicious!